La Casa De Papel is booming worldwide right now. But do Spanish audiences prefer Bron (photo), or telenovelas? Find out in Parrot Analytics' new report! Recently, Spanish series have gained attention for their international appeal. In hopes of replicating the worldwide success of Money Heist/La Casa De Papel and Cable Girls/Las Chicas Del Cable, international companies have started to invest more in Spanish dramas. However, importing and exporting content is by definition a two-way street: Is an opportunity to introduce international content to Spanish audiences being overlooked? There is of course a large market in Spain for international content; the United States has a huge impact on global content and Spain is no exception, content from the USA has the highest average demand of all international content in Spain. However, an important question to distributors is which region has the biggest impact on Spanish consumers: Spanish-speaking Latin America or the close neighbouring markets of Europe? This article leverages Parrot Analytics’ cross-market global TV demand data to reveal which region’s imported content appeals best to Spanish audiences. Note: To avoid the effects from the generally high reach of English-language content, this study excludes the UK and Ireland as these countries primarily produce content in English. The shared language of Spain and most of Latin America (with the notable exception of Portuguese-speaking Brazil) leads most people to assume that Latin American content performs better, on average, than content from non-Spanish speaking Europe. 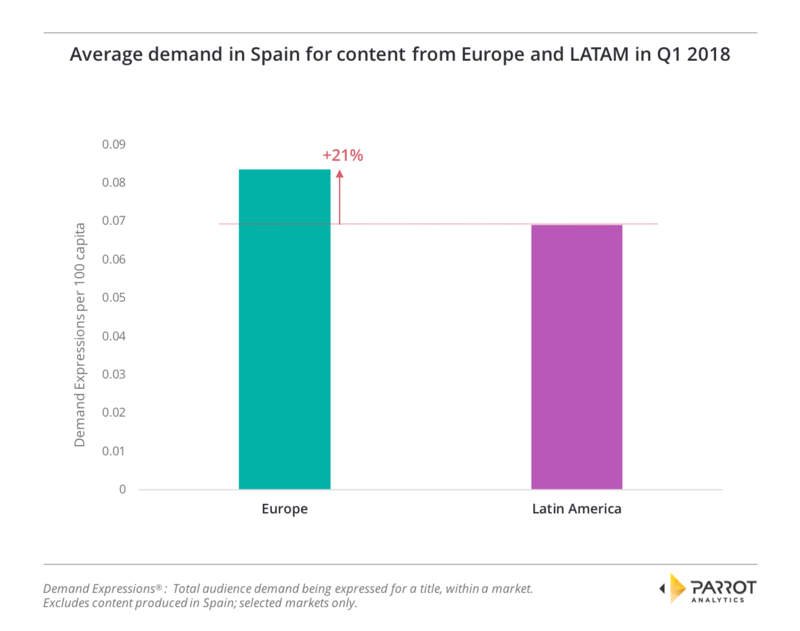 By 21%, Spanish audiences prefer content from Europe over content from Latin America. Which specific countries produce the content that audiences in Spain like? Breaking the data down to the country-level analysis shows exactly which content is preferred by Spanish audiences. (A reminder that this study excludes the UK and Ireland as these countries primarily produce content in English; we have excluded these markets to avoid the effects from the generally high reach of English-language content). Our investigation shows that content from Sweden has the highest average demand in Spain. Swedish content has a very strong 49% lead over Argentina, the second most in-demand origin. 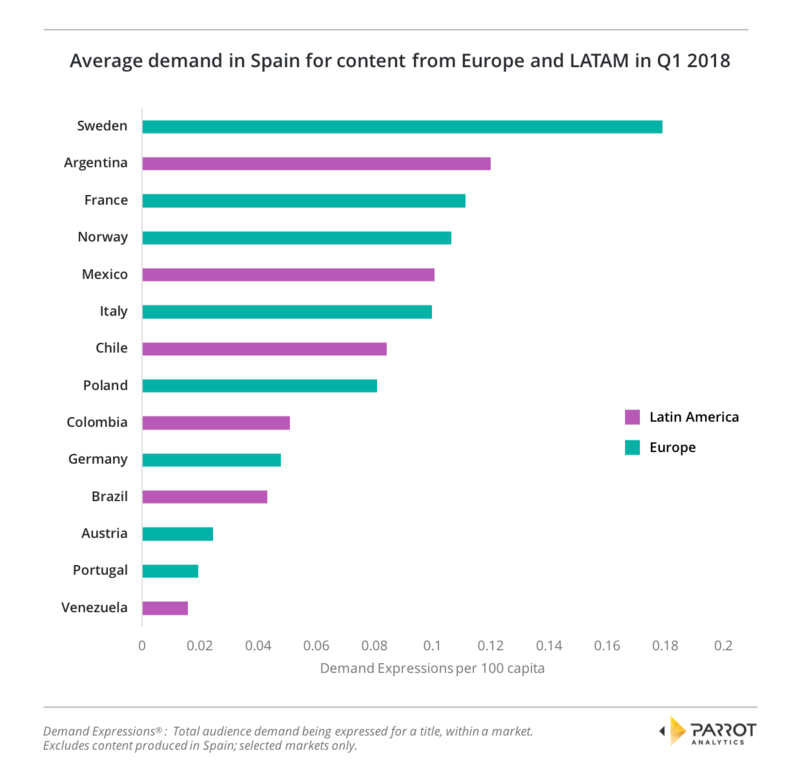 Spain’s neighboring country and major content producer France had the third highest average demand of the European and Latin American countries, followed by a second Scandinavian country, Norway. The second most in-demand content from Latin America in Spain and fifth out of all European and Latin American countries are titles from Mexico. Unsurprisingly given the country results, both of the top European titles are Swedish. Also in line with Spain’s general country content preferences is the top Latin American title, Argentinian Soy Luna. However, the second most in-demand individual Latin American title in Spain breaks from this pattern as it is a Chilean show, reality title Doble Tentación. The finding that Spanish audiences prefer European content over Latin American content demonstrates that the true preferences for a local audience revealed by utilizing data can often be different to the received wisdom. For distributors, this type of insight can open up new opportunities that may not have been considered previously. 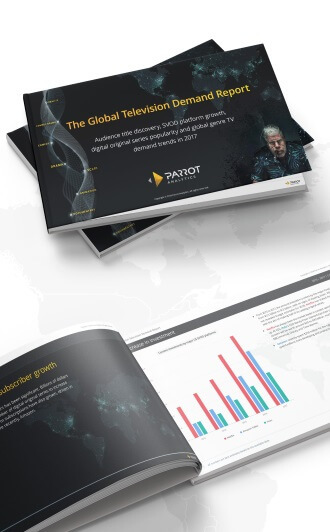 MIPTrends is excited to share Parrot Analytics’ latest in-depth global research report with you: The 2017 Global Television Demand Report. This 65 page in-depth whitepaper takes a comprehensive look at global television audience demand trends across 10 markets in 2017: Australia, Brazil, Canada, France, Germany, Japan, Mexico, Spain, the United Kingdom and the United States. Parrot Analytics reveal how TV audiences discover new TV shows to watch in each market, the top digital original shows in each country as well as genre trends and SVOD platform market share in each country for 2017. > Download this report now.